Forests Of Sumatra [E1500] - $18.00 : Yarn Tree, Your wholesale source for cross stitch supplies. Cross stitch pattern by Ink Circles. 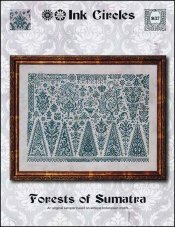 "Forests of Sumatra," is an original sampler based on antique Indonesian motifs. Stitch count 301w x 216h.